This guide has been designed to help you choose the best curtain pole for your requirements, style and budget. We appreciate that with the plethora of products available it is hard to know where to start to look so hopefully this will help you with your decision making process. Please watch our YouTube video below that also talks you through the options and things to consider and remember to subscribe to our channel for more useful tips! The first decision is really to decide what material of curtain pole you are interested in as this will narrow your search down. The most common materials are metal curtain poles or wood curtain poles. We also offer two speciality materials and have a range of beautiful wrought iron curtain poles and striking acrylic curtain poles. The choice of material is really down to personal preference and the look and style you want to achieve. Metal curtain poles tend to be more contemporary in design and finish, however we do have a range of antique brass poles which lend themselves to more traditional design styles. Metal curtain poles also offer greater flexibility in functionality (please see functionality sections below) and eyelet curtains tend to glide more smoothly on a metal pole vs a wood pole. Wooden curtain poles often come in a variety of colours so can work well with a plethora of interior design colour schemes. They are also available in wider diameters than the metal poles so work really well with heavier curtains. The wider diameters can also help to balance the look with heavy, lined and inter-lined curtains and can really create a wow factor at your window. We now have an extensive range of corded wooden curtains poles which look stunning. We have categorised our curtain poles for this category as those that are available in a 360cm length and over. If you require a metal curtain pole over 360cm the best ranges to consider are the Rolls Neo, Jones Lunar and Jones Strand curtain pole ranges. These offer a 3m pole as a single length. You can join two together to give you a maximum width of 6m. Rolls Galleria may also be worth considering. The Galleria poles are available in a 35mm and 50mm diameter and go up to 480cm. Integra Inspired also offer poles up to 480cm. The Jones Handcrafted Wooden Curtains poles are truly stunning. They have a wide portfolio of products available from a 30mm up to an impressive 63mm diameter! All of their poles are available in a 3m as a single piece giving you a maximum width of 6m. They also offer a bespoke paint service and can paint any of their hand crafted poles in a colour of your choice. Please read our Bespoke Paint Service blog post for more information. Other Wooden curtain pole ranges suitable for extra wide windows include the Rolls Modern Country (available up to 6m), Rolls Museum (available up to 480cm) and Hallis Hudson Origins ranges (available up to 480cm). You may also wish to consider the Silent Gliss Metropole range. These are curtain tracks that look like a curtain pole but operate like a track (so are not suitable for eyelet curtains). The brackets on a Metropole don’t interfere with the track profile so can be supplied up to 6m as a single piece. These offer a stylish alternative to a curtain pole and may be worth consideration. They are also all made to your exact size at no extra cost. We offer a range of curtain poles for bay windows. If you have eyelet curtains the New Neo bay window curtain pole has been specifically designed for eyelet curtains (it can also be used for curtains with rings). It offers a fantastic solution and the curtains glide beautifully around the corners. Please see our blog post for more details. If you have curtains with rings there are a few options. The standard Neo bay curtain pole may be worth considering, the Swish Belgravia curtain pole is popular and the Swish Design Studio has a range of bay window curtain pole options that can be wall or ceiling fitted. If you are looking for a value bay window curtain pole the Jones Cosmos pole offers exceptional value or you may also wish to consider the Universal bay curtain pole. Curtain tracks are also very popular for bay windows and we can bend any of the Silent Gliss tracks to your requirements. Please see our YouTube video that talks you through the different tracks. The Silent Gliss Metropole is also extremely popular for bay windows. These look like a curtain pole but operate like a track and again can be bent to your requirements for your particular bay. Corded curtain poles can be useful if your curtains are of a delicate fabric such as silk, or a light colour, or quite simply you’ve spent a lot of money on your curtains and don’t want people touching them!! The cords enable you to open and close your curtains without the need to touch them! Corded curtain poles can also be useful if your curtain sits behind a sofa for example where opening and closing your curtains can be tricky. The cords also keep the curtains in position so the stackback can be smaller than on a hand drawn curtain pole. We offer a small selction of metal corded curtain poles available in a chrome or brass finish. Our ranges of corded wooden curtain poles are fantastic and look truly stunning. Please take a look at our YouTube video that shows you a product sample and talks you through the options in more detail. Corded wooden curtain poles are available in the Rolls Modern Country, Rolls Museum, Hallis Hudson Origins and Byron and Byron ranges. Please see our brand page for more information on the brand styles. In theory all poles can be used for eyelet curtains, however they do tend to glide more smoothly and are more popular on a metal curtain pole. You can purchase some curtain poles specifically for eyelet curtains and rings are not supplied. The most popular ranges are the Rolls Neo and Jones Lunar and Jones Strand. The Swish Design Studio and Integra Inspired also offer the eyelet option. Some of our more value ranges don’t offer the option to take the rings out so you will just have to purchase the pole with the rings and not use them. Standard ready-made curtains tend to use a 40mm eyelet and as such we could recommend a 28mm curtain pole. A 35mm pole will fit but you may just need to help your curtains along the pole. A 50mm eyelet is recommended for a 35mm curtain pole. If you have a 50mm pole a 66mm eyelet is available for the larger diameter. If you want to create a layered look or use a voile and a curtain for extra privacy we offer a range of double curtain poles. The Rolls Neo Double Curtain pole is our best selling range. This features a 28mm pole at the front and a 19mm pole at the back and is available with any of the Neo finials. For a country cottage layered look the Artisan range offers a double curtain pole solution in wrought iron. Their double poles feature a 16mm pole at the front and a 12mm at the back. These are available with any of the artisan finial designs. You may also wish to consider the Jones Triple Track for a ceiling fix option. This is an extremely popular product. If you would rather extend your pole rather than cut it to the exact size we offer a selection of extendable curtain poles. The Swish Elements range has a good selection. For a really stylish look you can have any of the Jones Handcrafted curtain poles painted to a colour of your choice. So you could match your pole to a feature wall which looks fantastic and makes a design statement. Please see our Bespoke Paint Service blog post for more details. Any of our curtain poles can be cut to size by yourself with a junior hacksaw. We do however offer this service on some ranges. There is a free cut to size service on the Rolls Galleria, Rolls Museum, Rolls Modern Country and Hallis Hudson Origins ranges and any of the Jones curtain poles can be cut to size for a small charge. All of our wooden corded curtain poles are also made to your exact size at no extra cost. You may wish to consider a slim diameter curtain pole if you have lightweight curtains or a small window. Brands that offer a slim diameter include the Rolls Neo 19mm range, Swish Elements 19mm, Integra Inspired 19mm or the Universal range. The specialist Artisan wrought iron range is only available in a 12mm or 16mm diameter for the country cottage look. Wooden curtain poles start at a 28mm diameter. 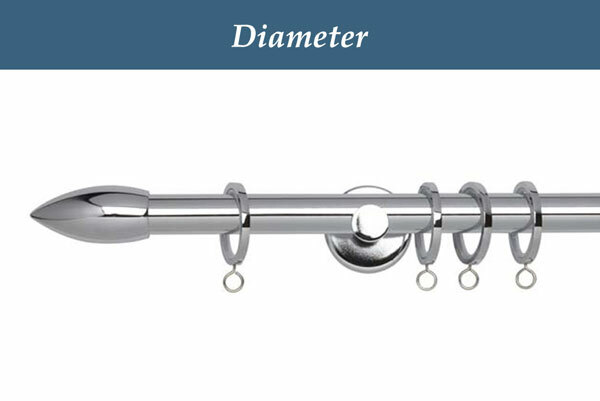 The most common diameters for a curtain pole is either a 28mm or 35mm. We sell a wide selection of both metal and wooden curtain poles in this size. You may wish to consider the Rolls Neo, Swish Elements, Swish Design Studio and Integra Inspired ranges that are available in both a 28mm and 35mm diameter. The Jones Lunar (28mm) and Jones Strand (35mm) are also two of our best selling ranges. Our more value brands in this diameter range include the Jones Cosmos, Quartz and Astra poles and the Universal range of curtain poles. The Rolls Honister and Jones Shore ranges offer a classic ball finial design in some en trend colours that work beautifully with current interior design trends. The tonal colours mean they work really well with a wide range of colour schemes and design styles. For a more classic finish the Rolls Woodline offers a good selection of finishes in both a 28mm and 35mm diameter. The Jones Handcrafted 30mm Cathedral, 40mm Hardwick and 40mm Seychelles ranges are also very popular and offer a range of colours to complement both contemporary and more traditional design styles. A large diameter curtain pole can create the real WOW factor at your window. The larger diameters work really well to help balance the look of a heavy curtain, work well at large windows or in large rooms, and at tall ceilings. They also carry the weight of heavy curtains. The 50mm Rolls Galleria offers a fantastic range of curtain poles that look truly stunning. The range offers a variety of handcrafted finials along with simpler styles such as the Orb (ball) style. Please see our YouTube video that talks you through the range in more detail. There is a wider choice of curtain pole ranges in the larger diameters in the wood finish. The Rolls Honister offers exceptional value and some fantastic, contemporary tonal colours. Please watch our YouTube video for more information. The Rolls Woodline is also popular and offers a range of more traditional finishes such as a dark oak and rosewood. The Jones Handcrafted curtain poles are truly stunning. The Jones Florentine (50mm) and Jones Estate (50mm) are very popular ranges along with their Oakham (50mm) range. For a real statement the Jones Grande (63mm) range is worth considering. The Rolls Modern Country offers a lovely range of 45mm and 55mm diameter poles in a choice of painted and natural washed and waxed finishes to give a range that sits beautifully in town and country homes alike. The Rolls Museum range uses the finest woods and each pole and decorative finial are handcrafted to bring a stunning lift to your room. They are available in a range of more modern colours such as the greystone, flagstone and satin oyster along with more classic finishes such as satin mahogany and antique gilt. The Hallis Hudson Origins range offers a range of neutral, tonal colours to offer a backdrop to a variety of interior design styles and colour schemes. The neutrality brings an air of calm into a room. Finally the Byron and Byron Tiara range offers a range of four contemporary metallic finishes with subtle crystal detailing. Please also see our Corded Wooden Curtain pole post for more information on our corded options in this wider diameter. Finally budget! We have only listed brands on our website that we are proud to sell and that offer exceptional value. We constantly review our prices to ensure we are offering you the best prices on the market. Even our added value products are priced to offer exceptional value for the quality of product you will receive. Our value ranges are still a step up from a DIY specification of product. For value brands please consider the Universal, Swish Naturals, Jones Cosmos, Quartz and Astra and Swish Elements metal brands. Rolls Woodline, Rolls Honister and Jones Shore ranges offer exceptional value in a wood offering. Added Value – the Rolls Neo, Jones Lunar and Jones Strand are extremely popular ranges and are used a lot by independent soft furnishers and interior designers. Our prices enable you to get the interior design finish at fantastic value. The components in these ranges are superb and look extremely stylish. You may also wish to consider the Swish Design Studio range that offers a range of design led finial styles. The Rolls Galleria range is a super premium metal curtain pole range. The curtain poles are supported by solid die-cast brackets and the handcrafted finial designs offer the real WOW factor. You may also wish to consider the Integra Inspired range that offers a range of 45mm metal curtain poles. In a wood finish the Jones Handcrafted curtain poles are truly stunning, along with the Rolls Modern Country, Rolls Museum and Hallis Hudson Origins ranges. Please refer to our curtain pole brand page for more information on the different brands. We hope this helps you with the decision making process. If you still aren’t sure please call us on 01590 615775 and we can have a chat about your requirements and send you some links via email to recommended ranges. 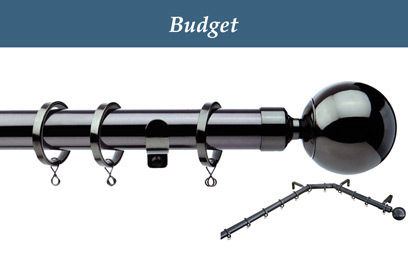 Thank you for reading our post on how to choose the best curtain pole for your requirements.